Microsoft Translator enables you to translate text or speech, have translated conversations, and even download languages to use offline. 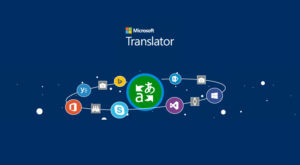 Microsoft Translator is a multilingual machine translation cloud service provided by Microsoft. The Microsoft Translator API is integrated across multiple consumer, developer, and enterprise products; including Bing, Microsoft Office, Yammer, Microsoft Lync, Internet Explorer, Skype Translator, SharePoint, Visual Studio, and Microsoft Translator apps for Windows, iPhone, Windows Phone, and Apple Watch, and Android phone and Android Wear. The Multilingual App Toolkit (MAT) is an integrated Visual Studio tool, which allows developers to streamline localization workflows of their Windows, Windows Phone and desktop apps. MAT improves localization of file management, translation support, and editing tools. The service supports 60 language systems as of April 2017. It also supports 10 speech translation systems that currently power Skype Translator and Skype for Windows Desktop, and the Microsoft Translator Apps for iOS and Android. Russian, Romanian, Serbian (Cyrillic), Slovak, Slovenian, Serbian (Latin), Spanish, Swedish, Thai, Tahitian, Turkish, Urdu, Ukrainian, Vietnamese, Welsh, and Yucatec Maya. Microsoft Translator also offers text and speech translation through a cloud API as a service for businesses. Service for text translation ranges from a free tier supporting two million characters per month to paid tiers supporting billions of characters per month. The speech translation API, released in March 2016, is offered based on time of the audio stream and ranges from a free tier of 2 hours per month to paid tiers of up to 100 of hours per month. Microsoft Translator uses machine translation to create instantaneous translations from one natural language to another. Let’s know something about Microsoft Translator API. The Microsoft Translator API is a cloud-based automatic translation service that can be used to build applications, websites, and tools requiring multi-language support. Speech translation: The Microsoft Translator API is an end-to-end REST based API that can be used to build applications, tools, or any solution requiring multi-languages speech translation. Speech to speech translation is available to or from any of the conversation languages, and speech to text translation is available from the conversation languages into any of the 60 supported language systems. Text translation: The API can be used to translate text into any of the languages supported by the service. Text to speech: Translated text can be converted into speech output using speech synthesis. Microsoft Translator is powered by cutting-edge technology used by Office, Bing, Skype, Internet Explorer as well as by partners such as Twitter, Yelp, eBay, WeChat and more. You have to remember some note that some features are not available in all languages. Location Permission: Microsoft only uses your location to show you where conversation occurred. Microsoft this location in your conversation history. Let’s know something about what’s new in this Microsoft Translator App. The quality of Microsoft Translator’s machine translation outputs are evaluated using a method called the BLEU score. BLEU (Bilingual Evaluation Understudy) is an algorithm for evaluating the quality of text which has been machine-translated from one natural language to another. BLEU was one of the first metrics to achieve a high correlation with human judgments of quality, and remains one of the most popular automated and inexpensive metrics. Quality is considered to be the correspondence between a machine’s output and that of a human. In November 2016, Microsoft Translator introduced translation using deep neural networks in nine of its highest traffic languages, including all of its speech languages and Japanese. Neural networks provide better translation than industry standard statistical machine learning.